We’re finally back after more than a year since Tip #1. Wow, time flies! In this tip, we’ll look at the setting to control the skinning of your Microsoft Teams client. Are you a light theme kind of person or do you stay to the dark side in your software?Teams provides three themes to choose from today. Default (Light)DarkHigh contrastTo change your theme, click your avatar to open the application menu, and select Settings. The theme selection is in the General settings section, which will open first. Here is the same application menu with the Default theme applied. And here it is again with the High Contrast theme selected. As you can see, no matter what your preference (or need), Microsoft Teams has a theme for you. Go try all three of them and maybe find a new favorite.Happy Teaming! A couple of weeks ago, I did an unboxing and initial impressions post about the KuaiFit K Sport Headphones on my Morning Dew blog. I’ve been using them for a couple of weeks and tried the companion training app for Android, and I’m ready to talk about my impression of the product.As I mentioned in my previous review the K Sport Headphones launched as a Kickstarter campaign last month. The campaign is now fully funded and has some early bird rewards still available. There are currently only 12 days left to join and get a pair for yourself. TechBash 2018 - Early Bird Tickets Available Now! Yesterday at Microsoft Ignite, Microsoft announced that Teams will be the go-forward client for "intelligent communications" with Office 365, eventually replacing Skype for Business. This move had been widely rumored in recent weeks. I have seen mixed reactions in my social networks since the announcement, with most feeling that it will be a good decision in the long run, if not an inevitable one, given the rise of Slack for online collaboration. In the announcement, the team also listed some recent and upcoming enhancements for Teams. Guest access was recently added for collaborating with users outside your organization, as was Outlook calendar integration, scheduled meetings and meetings via mobile. Integration with audio conferencing services was announced yesterday as being available in preview. Integration between Teams and Skype for Business is also being added, enabling messaging between the platforms and a shared online presence. Welcome to the first Microsoft Teams Tip! This tip is a simple one, but it can provide the Teams dev team with early insight on the latest fixes and features coming to Teams. If you enable Developer Preview in your Teams client, your client will automatically download these preview builds as they become available. 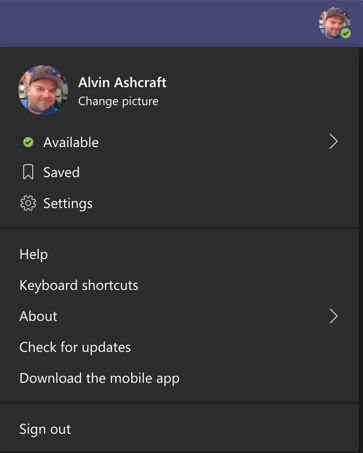 In the lower-left corner of MS Teams, click on your profile picture.On the menu that opens, select "About".If "Developer Preview" is not checked, click it to select it. That's it! You will now receive early preview builds of Teams. Hint: If Developer Preview is not available in the About menu, it may be disabled by your organization. My company has them disabled. Enjoy and be sure to provide feedback to the Teams team! Follow them on Twitter at @MicrosoftTeams. Welcome to MS Teams Tips! Welcome to my new "tips" blog, MS Teams Tips. My two previously launched Tips blogs, wpf.tips and uwpapp.tips, were more developer-focused. This blog will provide tips for everyday and power users of Microsoft Teams. New tips will be posted 2-3 times per month, with the first one coming in just a few days. Welcome and please subscribe or check back soon!